This soup from the Post Punk Kitchen is an old favorite and easily one of my favorite soups of all time. I’ve posted it here before, but it’s been a long time so I thought I would revisit. I’ve also changed my instructions slightly to cut out a couple of steps, making the prep time about 10 minutes. But first. BUT FIRST. Let’s get to these biscuits. It’s been probably close to two decades since I’ve been to a Red Lobster. Something recently made me think of those biscuits they give you — salty, cheesy, flaky, bottomless baskets of delicious cheddar bay biscuits. PROBABLY not the healthiest thing on the planet, but making them at home helps. I found this recipe on the blog Amazeballs Eats. She always seems to like things she helped make more, but I can’t disagree. She was a great sous chef. Do cheddar biscuits go with Thai flavors? I don’t know. But they were both good and nobody complained. Good enough for me. Even the toddler ate some of the soup, which does have a bit of a kick in the background. She would eat a spoonful, say “hot,” push it away, then ask for more. I’ve tried to add different vegetables over the years — it’s perfect as is. Sometimes I have to learn the hard way just to leave it alone. Also, don’t skip the cilantro and sesame oil garnish on this one. You might think it wouldn’t make that big of a difference, but you would be wrong. It completes the soup and is so much better than without. Now to the recipes! Preheat oven to 475 degrees. Line a baking sheet with parchment paper or use a silpat. In a large bowl, whisk together the flour, baking powder, baking soda, sugar, salt, garlic powder and cayenne. Stir in the cheddar style shreds; set aside. Add the almond milk mixture to the flour mixture and mix gently with a rubber spatula just until a dough forms and no dry ingredients remain. Use a greased ¼-cup measuring cup to scoop out portions of dough. Place on the prepared baking sheet, leaving a little more than an inch between biscuits. Bake until the biscuits are golden brown, about 12 minutes. While the biscuits are in the oven, stir together the 2 tablespoons melted vegan butter, garlic powder and parsley. Remove the biscuits from the oven and immediately brush with the topping mixture. Allow to cool for at least 5 minutes before serving. 1. In a stock pot, saute onion and ginger in oil for about 5 minutes, until soft. Add curry paste and cook for another minute or so. 2. Add sweet potato, diced small, and stir for about a minute. 3. Add coconut milk and veggie stock. Bring to a boil, then lower heat and simmer for 15-20 minutes, until potatoes are cooked through. 4. Add lemon juice and salt. You’re ready to serve! 5. Once in bowls, drizzle with a little sesame oil and sprinkle with chopped cilantro (as much as you like). In a continued effort to utilize the many magazines I get, I decided to make this version of chickpea masala out of the latest issue of Vegetarian Times. From first cut to eating it was about 45 minutes — I’ll definitely make this again! It’s really close to another version I’ve been making for years (which you can find HERE in this 2010 post). The main difference is the lack of cauliflower here, which makes this even more of a pantry recipe. The only fresh ingredients you need are an onion, ginger (which you could keep jarred in the fridge for when you’re in a pinch) and a serrano pepper (which technically you could do without — it just wouldn’t be spicy). I only changed up a couple of things — I threw in a whole onion because I knew the other half would go to waste and I used two serrano peppers to spice it up a bit (I like things spicy these days and hey — at 38 weeks pregnant if it helps move things along…). I don’t have Greek yogurt around — and would rather keep it vegan anyway — so I didn’t use that. In the other version, I use coconut milk so I would gladly add that or coconut creamer in the future, but went without tonight. I started my brown rice, made the rest of the recipe and by the time it came to the “simmer for 15 minutes” part, there was about that long left on the rice — perfect! I cleaned up and before I knew it — dinner was served. 1. Heat oil over medium heat. Add onion and sauté 5 minutes or until softened. 2. Add garam masala, tomato paste, ginger and serrano, and season with a bit of salt to taste. Sauté one minute more. 3. 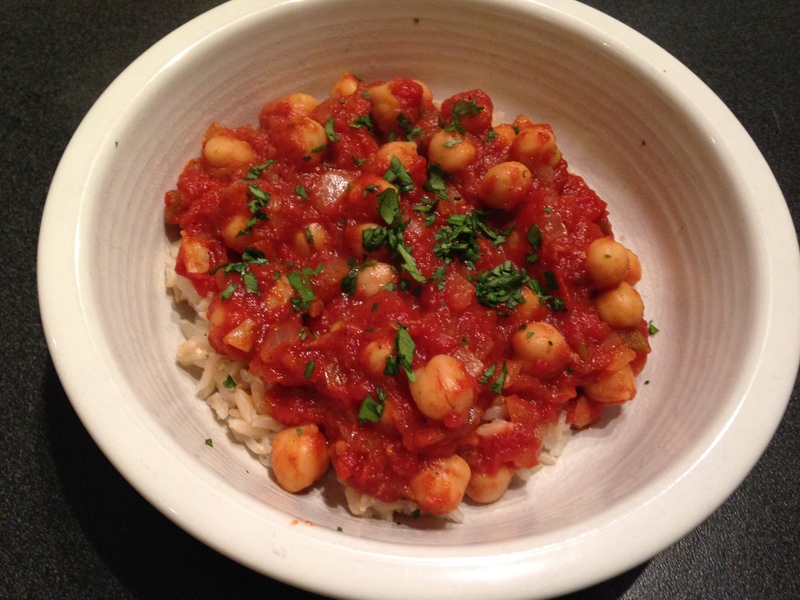 Stir in chickpeas and tomatoes. Bring to a boil, reduce heat to medium-low and simmer 15 minutes. 4. Remove from heat and stir in yogurt and cilantro. Though we usually don’t do a whole lot for Valentine’s Day, this year we are counting down our “free” pre-baby weekends and made dinner plans for Saturday night. We ended up going to Detroit’s Vicente’s Cuban Cuisine, which a former co-worker told me about years ago (back when I had co-workers right after moved to Michigan). I knew they had vegan paella for us but, as is the norm with most restaurants, there are no vegan desserts. I considered stopping by our local go-to for raw, vegan desserts, which I pick up from time to time since I’m to lazy to make it at home. I decided for Valentine’s Day perhaps I should step up my game a little. 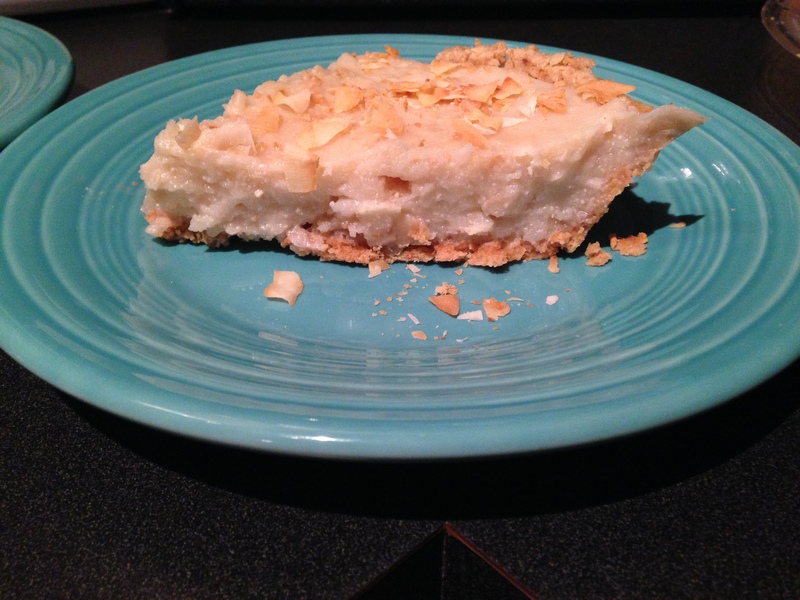 My squeeze loves coconutty things, so I googled “vegan coconut cream pie” and lots of recipes came up, some more intricate than others. Since I didn’t have a ton of time (or the foresight to have special ordered ingredients like agar agar), I decided to tryout a recipe that only had a handful of ingredients and was really fast. By the time I got done socializing at the grocery store, I was really crunched for time. Fortunately, there was a vegan graham cracker crust ready to purchase so I took the way easy route with that. Not that it’s hard to make one, but I don’t plan on using graham crackers again anytime soon so I figured why not. All you need are the crackers or crumbs, butter and sugar. You can find a really simple recipe you can use to make one from scratch HERE. If you’re doing the gluten-free thing, buy some kind of gluten-free cookie and use those (I’ve used g-f gingersnaps before for crusts — yum). The pie itself is gluten-free. I put the pie into the refrigerator a big before we left for the restaurant and it was perfectly set by the time we got home. I intended to make coconut whipped cream, but it said to refrigerate the coconut milk for overnight and again, there wasn’t enough time. I put it in the refrigerator with the intention of making it for further helpings today, but it was plenty delicious on its own so i didn’t bother. I definitely want to try some another time, though, and I think I go with THIS recipe from one of my favorite vegan blogs, Oh She Glows. OK, onto the pie. I grabbed the recipe from the site She Knows. Mine didn’t turn out yellow like theirs. Not sure what’s up with that. Tasted great though! And my husband thought so too, which I guess was the point. I think it’s about time for me to have another helping. Enjoy! • 3 c. coconut milk (this was roughly 2 cans) or 2 c. coconut milk and 1 c. soy or almond milk for less richness. 1. Preheat the oven to 350 degrees. Spread coconut flakes on a cookie sheet and bake for 5 minutes to toast, then set aside. 2. In a medium saucepan over low heat, combine coconut milk, tofu, sugar, cornstarch and salt. Cook stirring constantly until it comes to a boil. (I found a whisk works best. And I turned the heat up a little or I was going to be waiting all day for it to come to a boil at low heat I think…). 3. Remove mixture from heat. Add 3/4 c. of the toasted coconut and vanilla. Stir well, then pour into crust. 4. Sprinkle with half of remaining toasted coconut, place in refrigerator and let chill for 3 hours or until firm. 5. If using, top with whipped cream and more toasted coconut and dig in! on Amazon, with the intent of making some kind of healthy donuts this fall instead of the fried, sugary ones that present themselves at every turn each fall. After resisting bags and bags of donuts at Eastern Market two Saturdays in a row, I decided today was the day. Unfortunately, I was short a couple of ingredients, but my husband decided to make my pregnancy dreams come true. I wasn’t going to make him find the gluten-free section for flour, so these are regular floury vegan donuts. 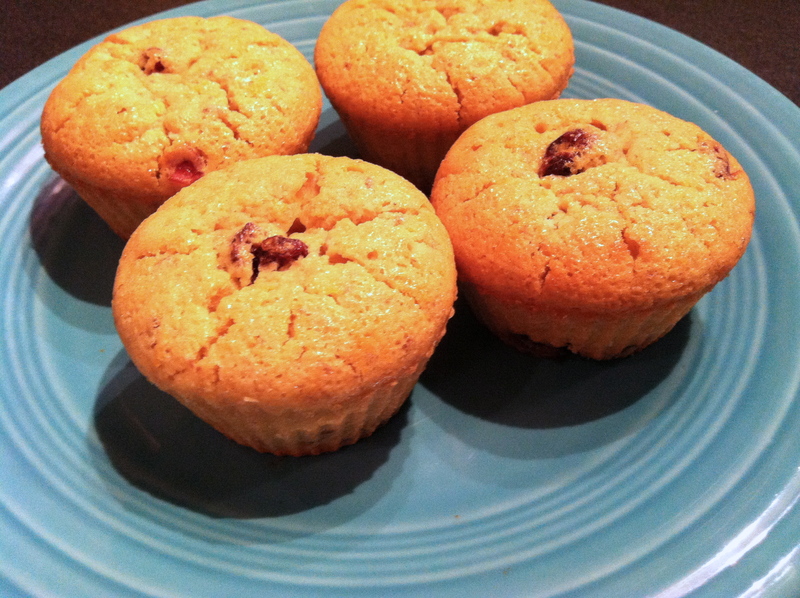 Next time I’ll try gluten-free so I can make them even healthier. These were easy and turned out great. 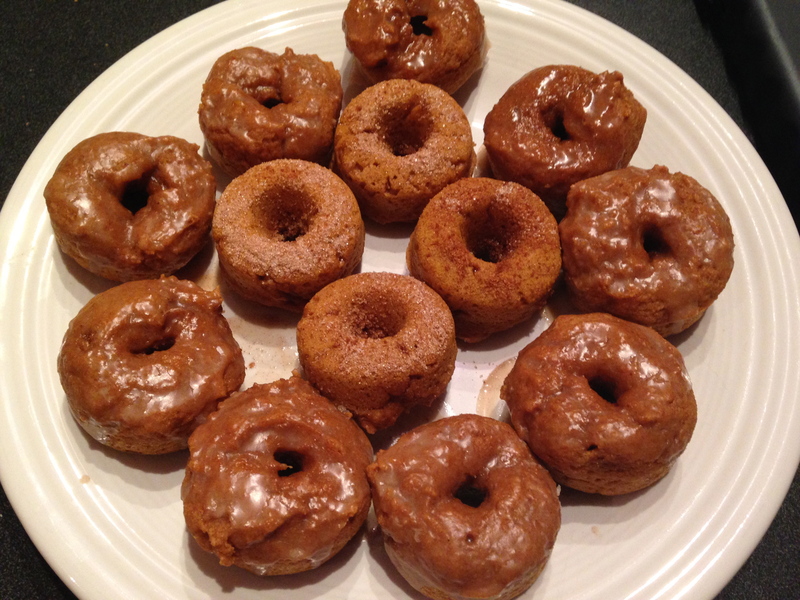 I just googled “vegan pumpkin donuts” and found my way to Vegenista, which had posted the recipe originally from blogger Bad Mama Genny. Both blogs look great! Because my donut pan is a mini donut pan, I wasn’t sure how long to bake them. I tried 8 minutes — the time posted for the recipes on the pan’s packaging — but they weren’t done yet. So, I did the full 12 minutes listed on this recipe and it was perfect. I iced some of them and put coconut sugar or cinnamon-sugar on the rest. These came out great! A really fast and easy recipe, sweetened with maple syrup and moistened with pumpkin and banana. I’ll definitely be making these again. 1. Preheat oven to 350 degrees. Mix dry ingredients. 2. Mix wet ingredients in a separate large bowl. 3. Add dry to wet ingredients slowly, mixing along the way. 4. Now it’s time to add them to your oiled donut pan. I wasn’t sure where to begin, so I went with my old stand-by for whenever I need to fill something. I spooned the dough into a large Ziploc bag, snipped off of a corner and piped it into the donut pan. 5. Bake 12 minutes at 350 degrees. They remove easier from the pan if you let them cool first, but really it wasn’t hard when they were warm. Drizzle with icing (feel free to add sprinkles, chopped nuts, etc. at this point too if you like) or sprinkle with cinnamon sugar right out of the oven (I found it stuck better to the bottoms). Forks Over Knives isn’t necessarily fat-free — there are nuts in many recipes including this one, but can usually be easily omitted. One thing it (and others, such as the Happy Herbivore series and Fat Free Vegan) has taught me is that you don’t need to use oil nearly as much as you have been. For example, to start this recipe you saute onion and garlic — but in a little bit of water instead of oil. Most recipes can be done this well (it certainly helps if you have nonstick pans). I finally sprang for the cookbook a few weeks ago and am glad I finally cracked into it. There are tons of recipes on the FOK website too, so no need to buy the cookbook if you don’t have it. This recipe was really easy and my whole family loved it — 10-year-old recovering picky eater included. I baked this in a 2-quart glass dish instead of a 9 x 13 pan as recommended. I’m not sure it made much of a difference, but it was kind of overflowing a bit. Because the pasta portion was thicker (vs. being more spread out in a 9 x 13) I took the end of a spoon and “poked” holes throughout the dish after I poured the cheese sauce on so it could seep down a little. Again, not sure if this was necessary, but it came out cheesy and delicious. And we only made it through not quite half of the dish, so there are plenty of leftovers. Expect more out of the Forks Over Knives book. It’s kind of amazing that health can taste this good. 1. Heat oven to 375 degrees. Cook pasta in salted water until just al dente or a little undercooked (it will finish in the oven). 2. Make N0-Cheese Sauce. Combine all ingredients in high-powered blender in order listed and puree until smooth, adding 1/4-1/2 c. water as needed to get blending going and reach desired consistency. Puree until smooth. 3. Place diced onion in a large saucepan and saute over medium-high heat for 7-8 minutes or until the onion starts to brown, adding 1-2 Tbsp. water when needed to keep onion from sticking. 4. Add garlic and oregano and cook for one minute. 5. Add diced tomatoes, season with salt and pepper, and cook over medium heat for about five minutes. 6. Drain the noodles and add to the tomato mixture. Mix well and pour into a 9 x 13 baking dish. It’s always a good season for squash, I think, but right now they’re everywhere. I made this easy side dish to go along with a new main dish tonight (more on that later). I make this for clients all the time but have never made it for my own family! I think it was C’s first time eating squash in quite a while — I remember the last time it certainly wasn’t her favorite but her taste buds seem to finally be coming around to all the veggies I’m shoving her way these days! D LOVED it. Definitely a winner for him. It roasts for more than an hour in the oven, so you have to make sure you have time to occupy the oven for that long, but it’s so easy — prep time is about 5 minutes. 1. Cut squash in half and remove seeds. Place in a 9 x 13 or other glass dish face up, with about 1/4″ to 1/2″ of water in the bottom of the pan. 2. Melt butter and coat inside and top rim of squash halves. A pastry brush works the best here, but you can work with what you’ve got. 3. Sprinkle 1 packed Tbsp. of brown sugar in each half. 4. Drizzle 1 tsp. of maple syrup into each half. 5. Roast at 400 degrees for one hour and 15 minutes or until squash is soft and tops are a little brown. It is easiest to dig right into your acorn half with a spoon. Enjoy!